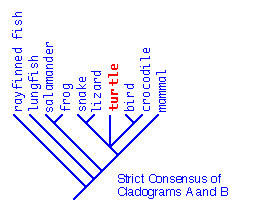 *Cladogram B is the currently preferred hypothesis although some molecular studies have recently favored cladogram A, placing turtles as sister taxon of Archosauria (including crocodiles and birds). 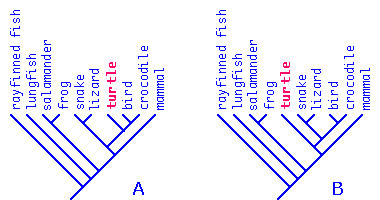 Click here for links to these different views or return to example. This page was first written on September 11, 2000 and last modified on September 11, 2000.